Does a pet-friendly merry Christmas, happy Hanukkah or festive Kwanzaa seem like a jingle bell crock? Do you have memories of the dog lifting his leg on the tree or the cat’s tail catching on fire as it swishes through the menorah? The holiday season does’t have to be that way for pet lovers. Here’s how to make them merry and bright for two-legged and four-legged celebrants alike. For dogs and cats, the holidays are full of mysterious packages, exciting objects in the home (A live tree! For me? ), and food, delicious food. All of those things can tempt pets to be naughty instead of nice, but there are some easy workarounds if you plan ahead. We all know that cats love to climb trees. A live or artificial tree with sparkly, dangly objects on it is well nigh irresistible. You have a couple of options for protecting tree and cat from harm. One is to place the tree in a room or area that can be blocked off with a closed door or surrounded by a tall baby gate or exercise pen. 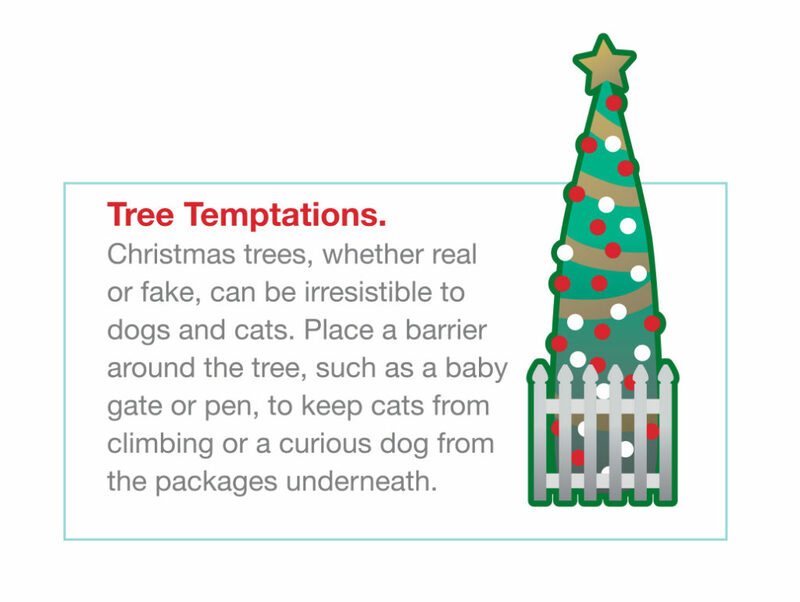 (Decorate the gate with soft, pet-friendly ornaments if you’re concerned that it will detract from your décor.) You can also use fishing line to anchor the tree to the wall or ceiling. Most important, avoid decorating with tinsel, which can cause serious internal damage if swallowed by cats attracted to the thin, shiny strips of metal foil. Dogs, too, can be attracted by trees (an indoor place to leave pee-mail!) or the packages beneath them. Restrict access to the tree except when the family is in the room to enjoy the lights, or choose a tabletop tree that can be placed out of reach. If you have food gifts such as chocolate-enrobed macadamia nuts from that trip to Hawaii, don’t place them beneath the tree until it’s time to unwrap gifts. “Any dog worth his salt is going to find that food and eat it,” says veterinary behaviorist Lisa Radosta. Winter holidays are marked by feasts, and our pets love to be part of the celebration. While it’s fine to give them small amounts of lean meats or baked sweet potatoes sans the sweet stuff, they don’t need an entire plateful of food. 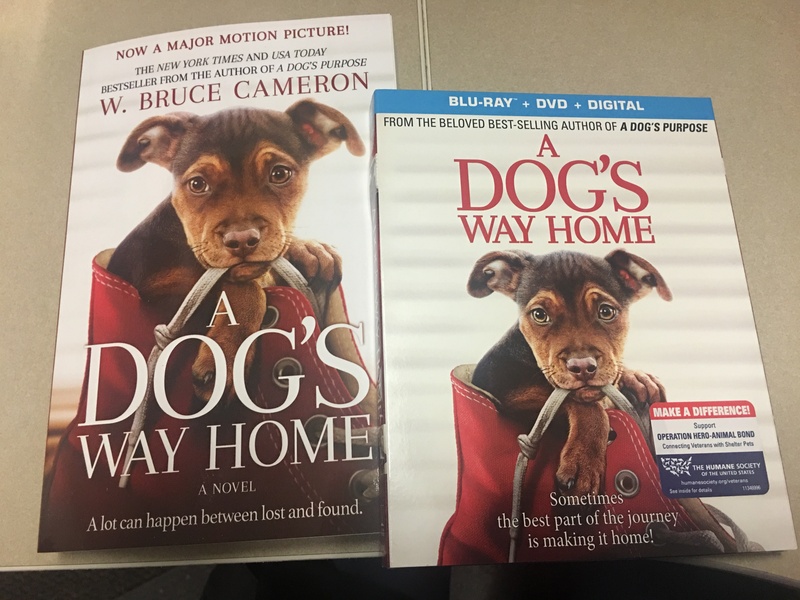 And don’t forget that a dog or cat’s keen sense of smell will lead straight to the garbage can where you’ve tossed strings or paper that wrapped meat, fatty trimmings, and other no-nos for pets. Chowing down on those items can bring on bouts of vomiting, diarrhea or pancreatitis. Secure garbage so it can’t be gotten into. Those macadamia nuts we mentioned earlier? They’re toxic to dogs. According to the ASPCA Animal Poison Control Center (APCC), dogs who eat macadamia nuts most commonly experience weakness in the back legs and vomiting. 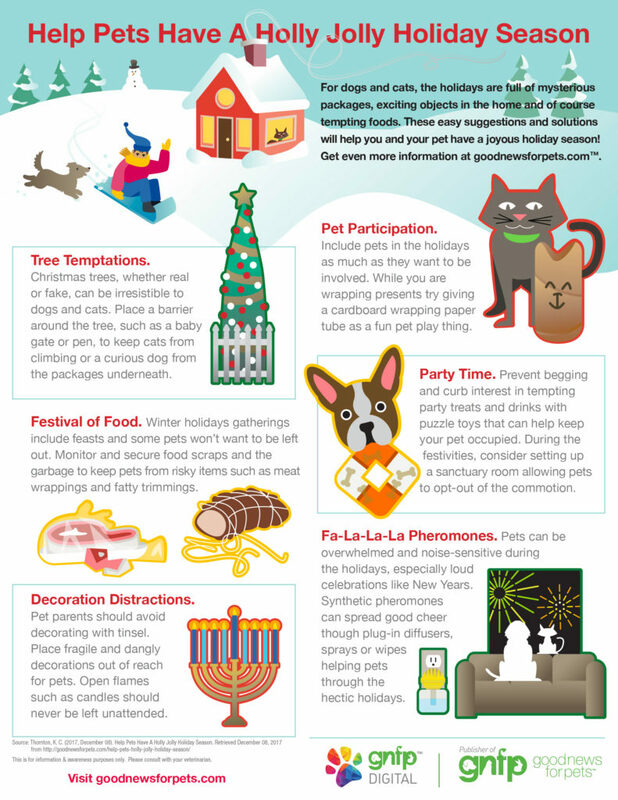 Include pets in the holidays as much as they want to be involved. Your cat may choose to hide under the bed or your dog to stay in her sanctuary room, but if you have a social butterfly, don’t leave her out of the fun. Make it easy by opening the side where you taped it, and let him go to town on the wrapping paper. The cardboard tubes from wrapping paper are also fun pet playthings. Another way to include your pet is to have him do tricks for guests: spin, shake, sit pretty, whatever he’s got. In addition to the scents of fir trees, fireplaces and spices rising into the air as cookies bake, bring the chemical contribution of synthetic pheromones that mimic those produced by dogs and cats. The chemical messengers, which have no odor, communicate a sense of calm and may help to relieve pets stressed by the presence of guests in the home or the whiz-bang and clang of New Year’s celebrations. 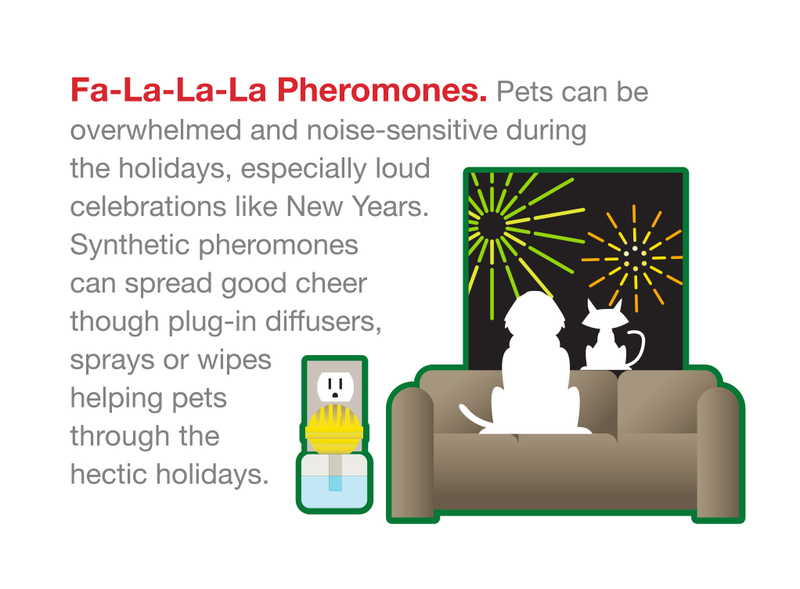 Pheromones can spread their good cheer through plug-in diffusers, sprays or wipes, making it easy to help pets relax during these most hectic of holidays. A large gather of family and friends can overwhelm even the most social pets. Ensure that guests know how to interact with pets, and keep an eye on things to prevent problems. For instance, pets don’t like being loomed over. Approach pets sideways without looking directly at them. If you toss a few treats their way, you’ll make a friend for life. Make sure dogs have a bed or mat and cats a tall perch or other resting area in the area where people are gathering but away from the commotion. A stuffed Kong or puzzle toy can help keep your pet occupied and prevent him from begging. Ask guests to give pets their space when they are in that spot. That way you don’t have to worry that your pet doesn’t feel safe. If he goes to his sanctuary room, ask people not to follow him there, Dr. Radosta says. If other pets are visiting, the American Veterinary Medical Association (AVMA) recommends planning to spend some time acclimating the pets to each other, supervising their interactions, monitoring for signs of a problem, and taking action to avoid injuries to pets or people. Share this infographic to make sure pets have a holly jolly holiday! This infographic is free to use, we ask that you please link back to goodnewsforpets.com if you share this infographic on your site or social.